Ticks and fleas are external parasites on canines which can totally drive you and your pet crazy. Your buddy will be itching all the time and constantly biting or chewing its skin to eliminate these pests. Good quality shampoos are one of the ways to get rid of fleas and ticks present on your pet’s body. If you are wondering ‘do tick and flea shampoos work?’ then this guide is for you. Many good brands of flea and tick shampoos are available online and offline. These shampoos do work provided you use them properly. For example, if your pet has a serious infestation, then you need to bathe it with the flea shampoo twice a day in rapid succession. The fleas will escape to the head when you shampoo your pet’s lower body. The key is to eliminate those rascals from the head, ears and other areas of the body. Massage the shampoo well into the wet coat and leave it on for at least 10 minutes. This can be annoying to your pet but you have to follow it strictly if you wish to eliminate these parasites once and for all. If you have multiple pets, you must bathe all of them using the flea shampoo. Likewise, if you have cats and dogs, then you need to use appropriate shampoos for both of them. Additionally, you need to treat your pet’s environment by vacuuming the house and cleaning its bedding. This will eliminate fleas and ticks eggs, larvae and nymph and reduce chances of re-infestation. You may also want to use additional flea and tick protection such as flea powders, sprays, spot medicines and tick collars along with the flea shampoo. Note that the flea shampoo may not show results in one use so you need to use it multiple times for good results. Before you go on to buy a flea and tick shampoo for your furry baby, make sure you get adequate information about it from a professional. Ensure that you read the product labels and that there are no harmful chemicals in the shampoo. Pyrethrin based shampoos are good options – they contain natural insecticides derived from chrysanthemums. Washing your pet with pyrethrin based tick and flea shampoo will eliminate most fleas and ticks and literally drown them. D-limonene based shampoos are also great for ticks and fleas but not as effective as pyrethrin shampoos. To use: Mix all ingredients. Wet your pet’s coat thoroughly and use the above mixture all over. Massage it in and lather well. Allow to stand for 10 minutes before rinsing off. Repeat application twice a week or as needed depending on the infestation. This is one of the best flea and tick shampoo. It contains Aloe, coconut extract and oatmeal which not only kills fleas, ticks, eggs and larvae; it also gives your pet a shiny and healthy coat. The effect of the shampoo can also last for up to 2 weeks. Adams Plus has cured massive flea and tick infestations and there are hundreds of happy pet parents who have given this product a 5 star rating. If your pet has numerous fleas or ticks on him/her, then this shampoo is a must have. Keep your pet outdoors after using this shampoo unless you want to end up with dead ticks on your floors. It suds nicely and yet rinses off quickly. If Advantix and Frontline are not doing their job well, then you need to use Adams Plus shampoo today. 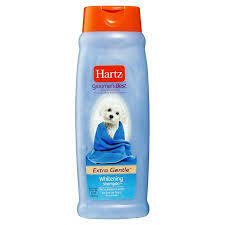 Hartz flea and tick shampoo works great, smells great and you will see the parasites dropping off your dog within its first use. The shampoo remains effective for almost 2 weeks after which you need to re-administer it. It contains soothing Aloe Vera to soothe irritated skin. There are three active chemicals in this shampoo, so it is not for use on puppies below 6 months of age. The answer to the question ‘do tick/ flea shampoos work?’ is yes, they do. However, you also need to clean up your pet’s environment and also use additional tick products like collars, spot treatments and powders or sprays. An integrated pest management approach is your best bet to keeping your pet parasite-free. We hope the above reviews for best dog shampoo for fleas and ticks help you make an informed choice. Are Dog Ticks Dangerous To Humans?